Sometimes I start blog posts that I never finish. They either turn all "unfunny" on me, or I get bored. Or I discover that I started to write it while sleep-deprived and return later, rested, to realize that it's total chaos. So, in an effort to utilize everything, I bring you "This Blog Post Makes No Sense," where I cram my post fragments all together and let you read the result. A wise Muppet once said, "Gersh gurndy morn-dee burn-dee, burn-dee, flip-flip-flip-flip-flip-flip-flip-flip-flip." And I have to agree with him. What is this world coming to? Because what if you're driving along in your wienermobile, on your way to the supermarket to buy breadcrumbs for your pet pterodactyl, and suddenly the earth opens up in front of you? You wreck your wienermobile by driving it into a crevasse. What will you do if you can't get yum-yum insurance? Well, you can't come crying to me. I have a hungry yak to feed. Furthermore, clowns. Who needs 'em? They should go back to the circus where they came from. I'm a clownist, and I don't care who knows it. I don't care if you're a rodeo clown, a party clown, or an evil clown who hangs out in sewers and eats children. I don't like you. Get out of my country, clown. The other day, I was at the party store getting supplies for my big noodle casserole cook-off and committee cat worming, when a clown approached me. He didn't say a word, just honked his nose and squirted me with a flower. I don't think he even spoke English. He just stood there with this stupid painted smile on his face. So like a good, unpainted American would, I carefully explained to him that here in America, we believe in the sanctity of balloon animals. Carrot Cake. You will eat it, and you will like it. 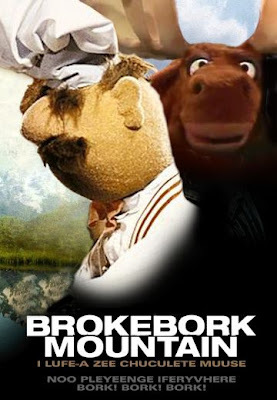 Oh my god, the Swedish Chef. I love the Swedish Chef so much. I would if I had some. Statler: The question is, what is a Manamanah? Waldorf: The question is, who cares? @t.c. : Ceiling cat is watching you. I care what a Manamanah is. I care DEEPLY. That reminds me, did I show you the merry monster when you came to my apartment? It does a version of 'Deck the Halls,' but the reason I bought it was for it's rendition of 'Manamanah.' The cat is terrified of it. @jen: I recall no monsters. But I want. You'll have to venture out to Brooklyn sometime soon, then. The merry monster awaits. I Have Cupcakes! You Can't Have Any! In the Future, There Will Be Fame for Everyone! Who Wants A Cookie? Cookies All Around! How to Date: Advice: Does It Have a Point? Do I? School Days Are Here Again!